Check out our super sweet and snuggly buddy Po, doing a little mash-up of the "Sunday Selfie" and "Easy Like Sunday Morning" memes. This handsome dude is such a special cat. He's very gentle and snuggly, and is almost always up for some nice, quality lap time whenever we visit. And he also likes to play when the mood strikes. 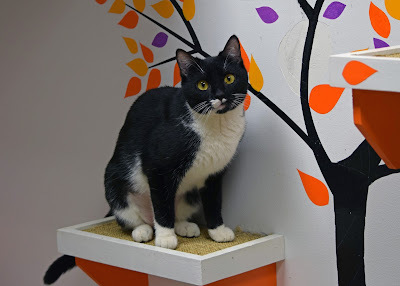 So, how did such an awesome kitty end up in a shelter? 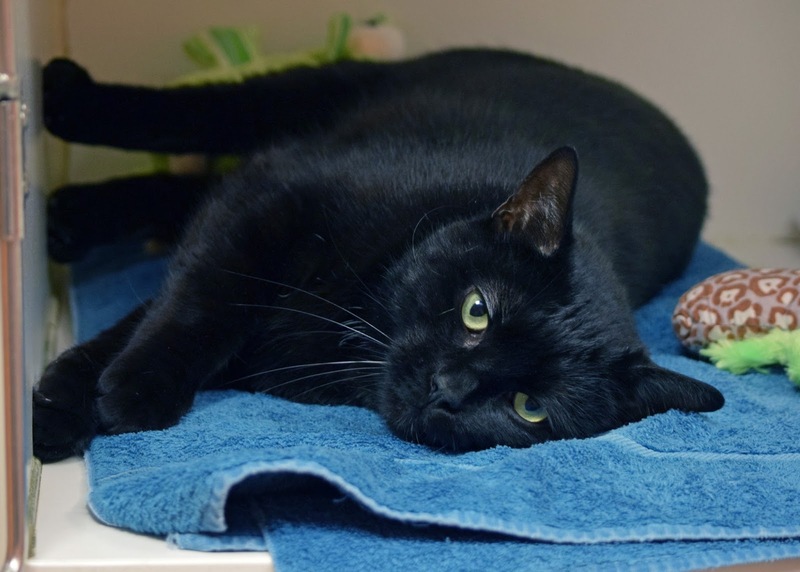 Heartbreakingly, Po came to PAWS when his owner had to go into a nursing home. We just can't imagine what that is like for him, or for his former human. Po seems to be adjusting well; his happy go lucky, gentle nature has made him a fast favorite among all of us volunteers. Po really, really wants and deserves a new, loving forever home. 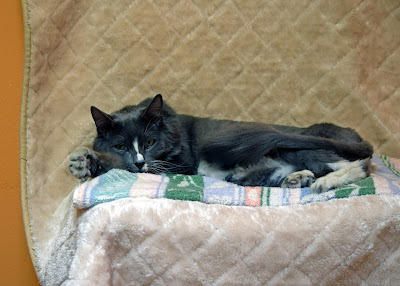 He's about 11 years old which - considering how long indoor cats live - means he has lots more love to give to whoever is lucky enough to adopt him. He's neutered, micro-chipped, current on his vaccinations, and negative for FIV and FeLV. 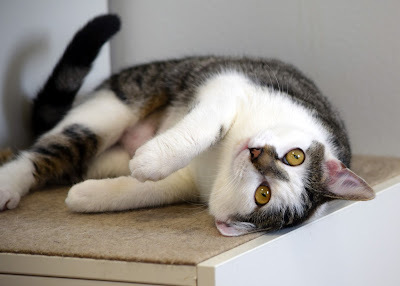 He gets along with most other cats, and as already mentioned, LOVES people. He's blind in one eye, but if it doesn't bother you, it definitely doesn't bother Po. He just needs somebody to give him a chance. Come fall in love with Po today. WE certainly all have. 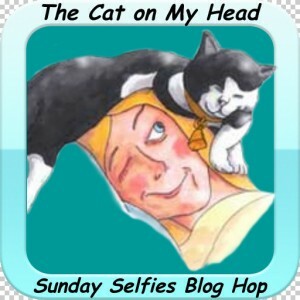 We're taking part in the Sunday Selfies Blog Hop, hosted by our beloved friends at The Cat on My Head. Be sure to stop by to see who's hopping this week, and/or to join in on the fun! 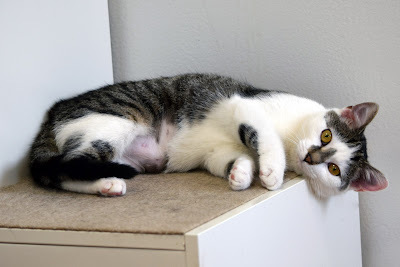 Our adoptable friend Tuna sure is cute, isn't she? Just look at that face, with that adorable little half-mustache. And that luxurious black and white tuxedo fur. Tuna is about two years old, spayed, micro-chipped, current on her vaccinations, and negative for FIV and FeLV. 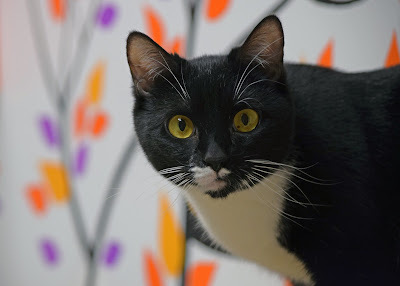 She's still a little shy, but is quickly learning that her volunteer and staff buddies (and humans in general) are sources of good stuff like petting, playing and food. Tuna would do best in a quieter home, with no small children. 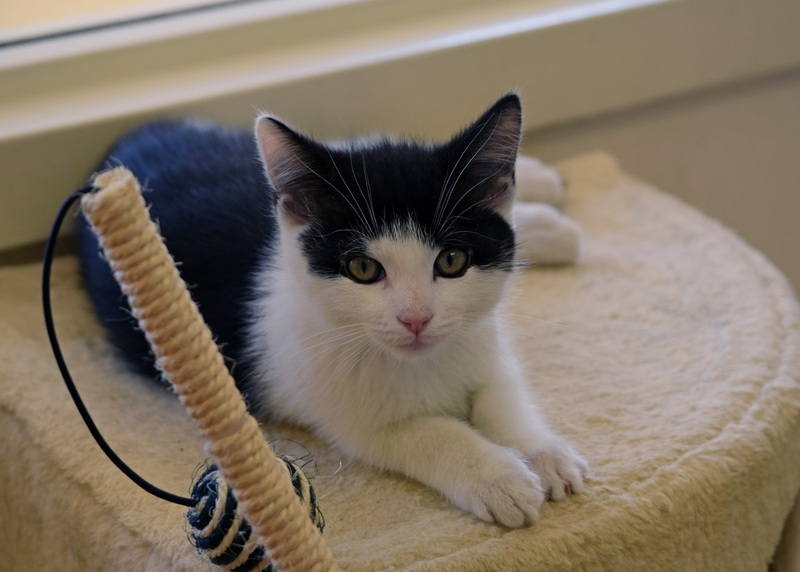 Once she finds her loving happily ever after, we're confident she'll blossom and become a confident ladycat and loyal best friend. Now all she needs is the chance. 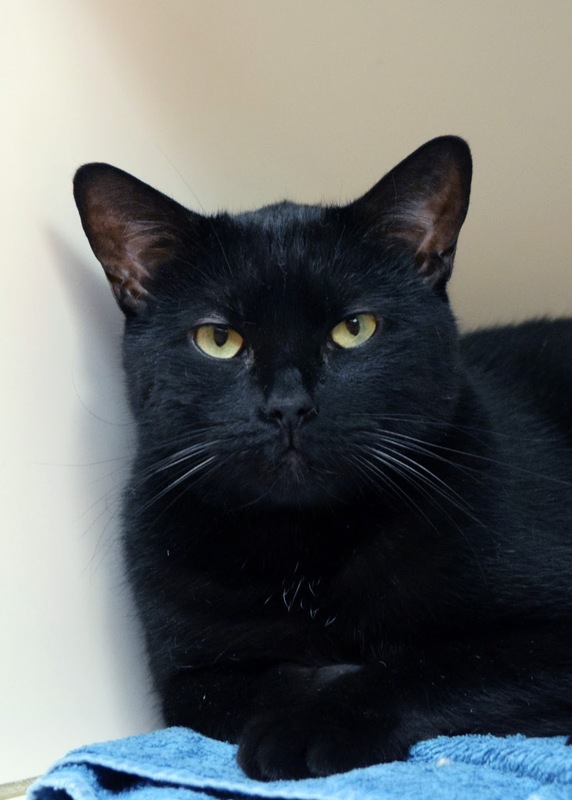 Doesn't our handsome housepanther buddy Meow-Wow have the sweetest face? And this is one book you can judge by its cover, because this guy is one of the most gentle, loving kitties we've ever met. 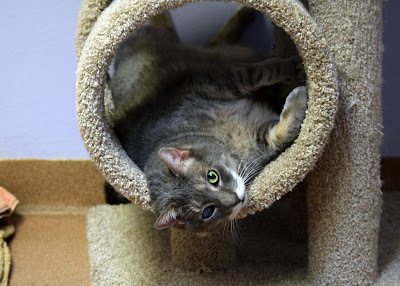 Meow-Wow is about 5 years old. He'd do best in a quieter home, without small children. 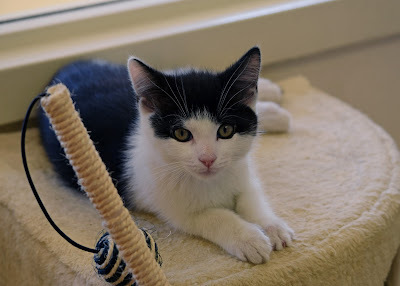 He's neutered, micro-chipped and current on his vaccinations, and has tested negative for FIV and FeLV. If you're looking for love, your search is over. Come meet Meow-Wow today! 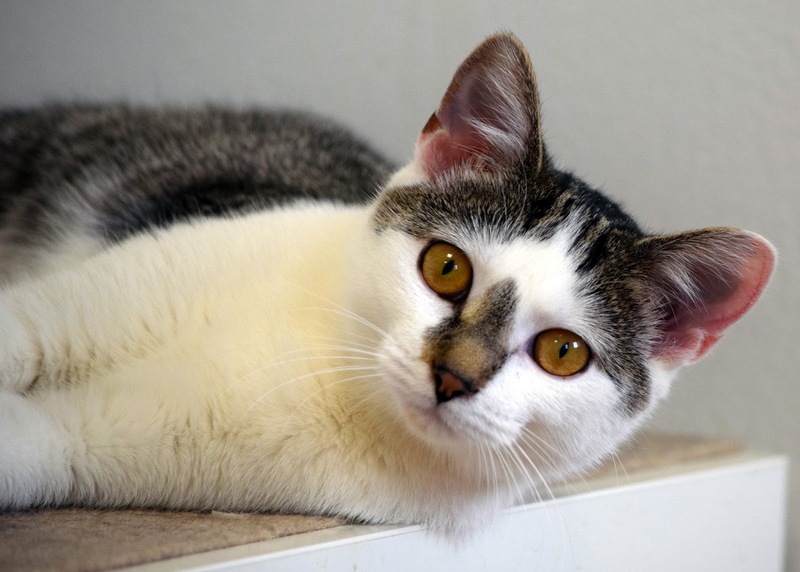 Tilly is about 2 1/2 years old, playful, and sweet as pie. She is spayed, micro-chipped, and current on her vaccinations. She's negative for FIV and FeLV. 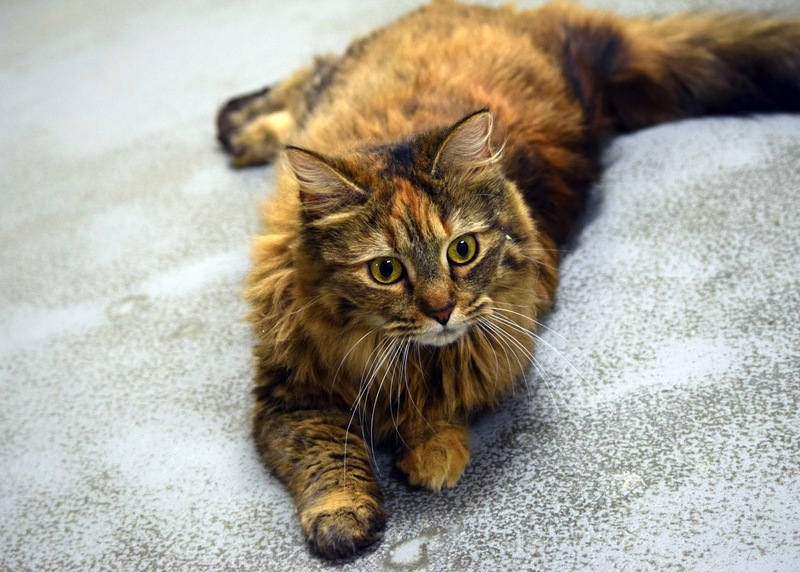 Tilly loves being pet, enjoys a good conversation, and gets along with some other cats. Come meet this floofalicious feline today! Wow! We're Nose-to-Nose Award Finalists! Here's our adoptable pal, Tilly, doing her best interpretation of "Shock and Honor." 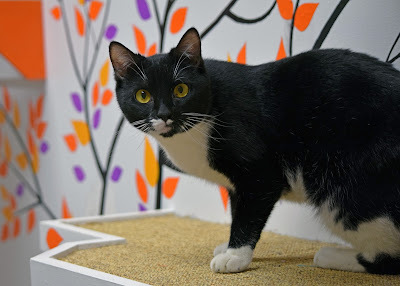 Which is exactly what we felt Wednesday night, when the finalists for the 2016 BlogPaws Nose-to-Nose Pet Blogging and Social Media Awards were announced, and we learned that Animal Shelter Volunteer Life has been named a finalist in the "Best Cause Blog" category for the second year in a row! 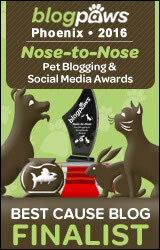 In a nutshell, the Nose-to-Nose Awards are the only pet industry awards in which pet bloggers and micro-bloggers are judged on the expertise, performance, and creativity of the entry. Each of the 12 categories is judged by a distinguished panel of professionals and not by popular vote. Winners will be announced at the BlogPaws 2016 Conference June 23-25 in Phoenix, Arizona. We're humbled to be included in any discussion of leading blogs, and with incredible bloggers (many of whom are good friends) we love and admire. Thank you to those who nominated us, to the judging panel, and to BlogPaws. We also thank all of you, dear friends, for sharing in our lives, and for your continued love and support. For the full list of finalists in all 12 categories, click here! 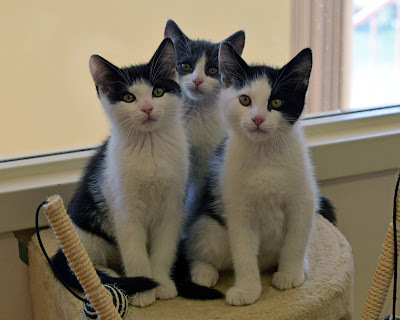 (Almost) Wordless Wednesday - Kittens in Da House! 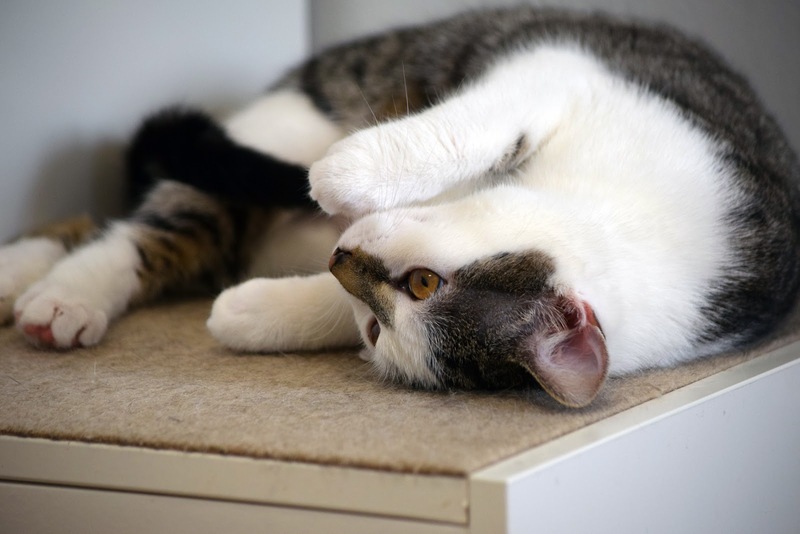 We're always amazed at how flat out adorable kittens are. 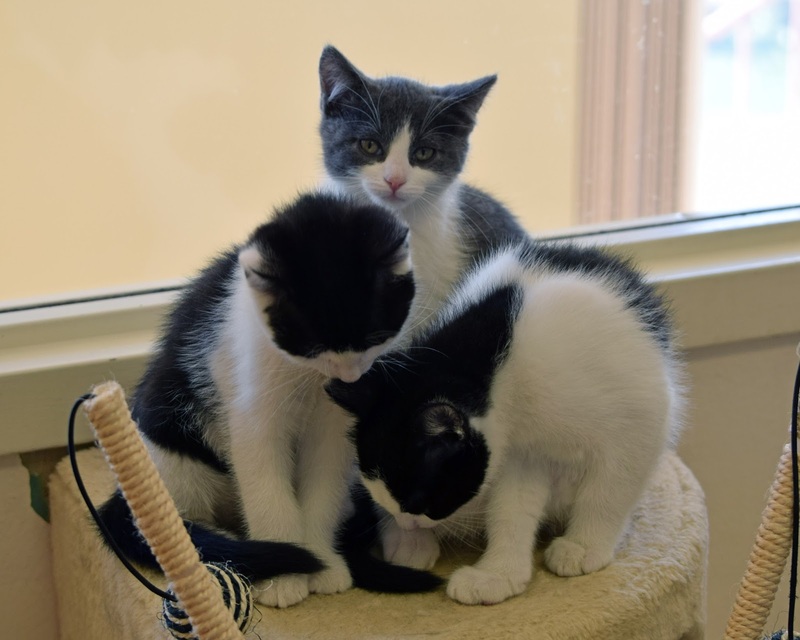 Just look at these cutie pies, who are waiting at PAWS to be discovered by their forever families. "Hey, is that a bug?" 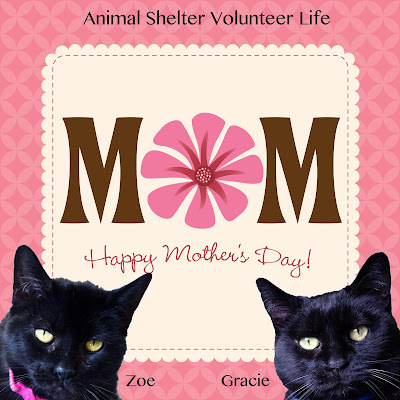 and to all mothers everywhere! 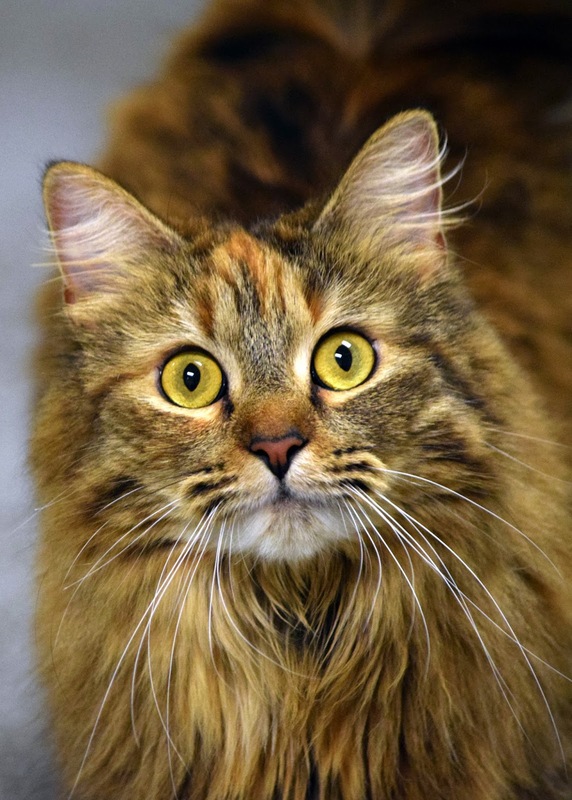 Beautiful senior ladycat Artemis has amazing eyes. 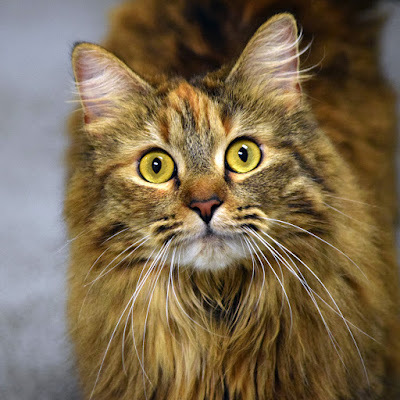 But there's more to this stunning kitty than meets the eye(s). "Artie" also happens to be a lapcat extraordinaire. In fact, it's pretty safe to say that laying in a warm human lap tops her list of favorite things. She's also extremely talkative (which makes it funny that she's appearing on "Wordless" Wednesday). Artemis is about 13 1/2 years old. She has severe arthritis, for which she gets a monthly injection of Adequan and a daily dose of Cosequin. These help her feel better, and able to do what she does best - seek out a nice cozy lap. 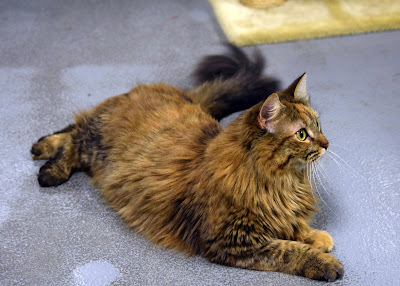 She would be a perfect companion for a lucky human who is home a lot (after all, home a lot = lots of lap time). Artie is spayed, micro-chipped, and current on her vaccinations. She is negative for FIV and FeLV. Happy May Day, everybuddy! Speaking of buddies, here's our handsome and adoptable pal, Buddy, doing his best "Most Interesting Man(cat) in the World" impression. 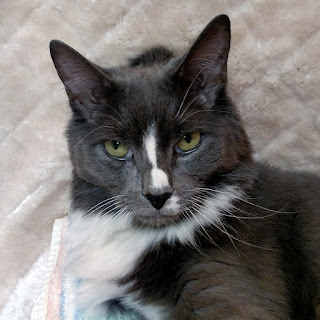 "I don't always pose for selfies, but when I do, all the PAWS volunteers swoon." Buddy loves to chill out with his favorite volunteer pals, and is a real snuggler. This dashing and debonair dude is about 11 1/2, neutered, micro-chipped, and current on his vaccinations. 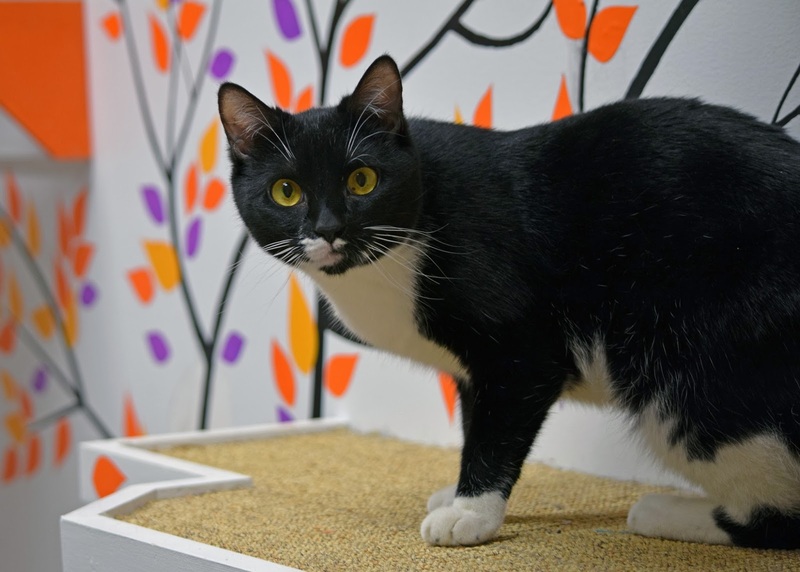 He would do best in a quieter home where the cuddles are abundant, but without small children or other animals. 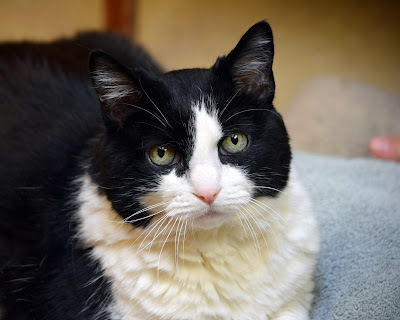 Buddy is negative for FIV and FeLV. He's totally ready to find his happily ever after. Now he just needs a chance.